Hello. I'm Vasilis ,captain A' class and I have more thn 25 years of sea experience. I like to see happy people around me and I can quarantee that you will enjoy your vacation on my sailing boat! I can't say enough about our amazing experience sailing with Alex, Pano and Hara. Vasili was incredible at coordinating our day and made sure our day exceeded our expectations. Hara went over and above in providing delicious Greek snacks throughout the day. Pano was a gem of a first mate to Alex our captain. 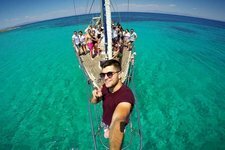 Alex was genuinely invested in providing an exceptional sailing experience. We had booked the day to celebrate my husband's 60th birthday. Our trip back was a little rocky due to the weather but Alex and Pano had it under control. Upon our return to port, Vasili surprised my husband with the most beautiful and delicious birthday cake. Thank you to Vasili, Hara, Alex and Pano for a memorable day from Helen, Joe, Steven, Greg and Lenna! We will see you again!